Is There Something Like Organic Sunscreen? The FDA does not allow sunscreens to be labeled as “organic sunscreens” and here is why. There are two ways sunscreens work. Physical sunscreens that physically block or reflect harmful UV rays from the skin. They have mineral pigments zinc oxide and/or titanium dioxide as active ingredients. Chemical sunscreens that absorb damaging rays using chemicals, filtering them before they reach the skin. These cannot be certified organic. 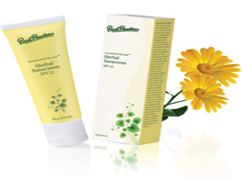 Herbal Sunscreen SPF22 is SCIENTIFICALLY PROVEN to provide a broad spectrum protection from harmful ultraviolet rays. Sun protection comes mainly from titanium dioxide (a naturally occurring mineral). Also added ethyl hexyl methoxycinnamat (also occurring in cinnamon leaves), LevensESSENTIE Gold® (herbal extract made from 22 organic herbs), vitamin E and vitamin A, as well as natural plant oils to soothe and moisturize. Coconut water, oil, meat, milk used in curries, jellies, jams or grated every part of this tropical treasure – the coconut – has its use. Some may be surprised that the fibrous shell is a perfect pot for an orchid, rice wrapped in coconut leaves, that serves for storage and cooking. Throughout India and Southeast Asia, coconut palm-leaves are stripped to make brooms and fuel for fires. For skincare and many other beauty products a natural emollient derived from coconut is used as a dispersing agent and carrier for active ingredients. Coconut oil contains Caprylic / Capric Triglycerides which forms a very light silky oil that does not feel at all greasy on the skin. 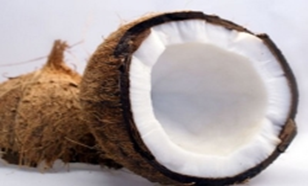 Triglycerides, also known as “fatty acids,” are a major component of human skin oils, and thus coconut derivatives make an excellent substitute, replacement, or restorative for the skin. 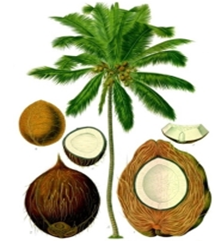 The coconut’s hard husk shell makes it differ from other fruit because animals do not normally eat it. While other fruits have spread across the planet by walking or flying animals, coconuts have floated on ocean currents to even the tiniest Pacific islands. The coconut palm tree (cocos nucifera) has very specific needs which is why it is mostly found along the seashores in tropical climates. It cannot tolerate cold, but on the other hand, it is very salt resistant. It requires high humidity which is why it is most often found close to the sea. And it needs lots of sunshine so it flourishes best close to the Equator. Two varieties are found – tall and dwarf. The tall ones can grow as high as 30m (98 feet) and produce (in very fertile soil) as many as 75 coconuts. Coconut water contains cytokines, a plant hormone shown to slow the aging process in plants. 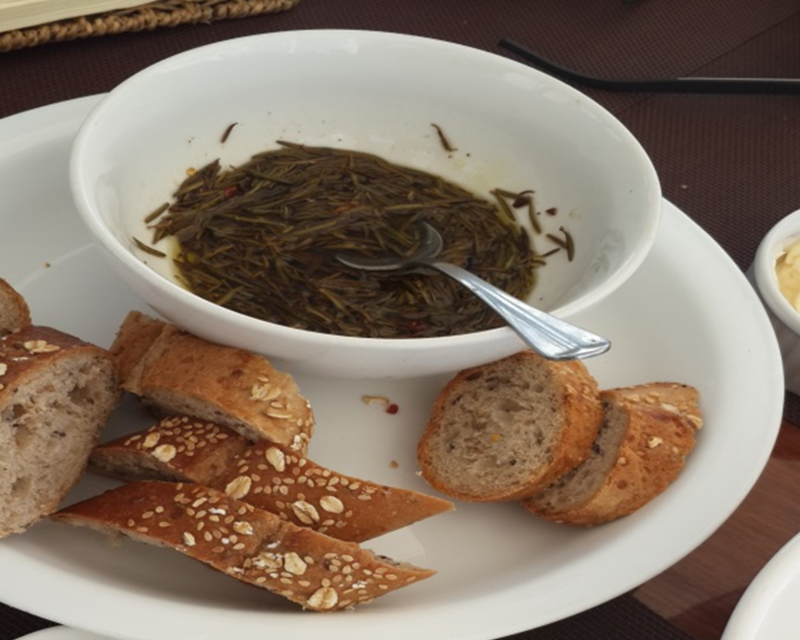 In technical terms, the water is liquid endosperm there to feed the seed as it matures. Nearly fat-free and 95% water, “Iron Man” and other sports enthusiasts swear by it as a post-workout ‘pick-me-up’ as it also contains a variety of key minerals including potassium and sugars. Women throughout Asia have used coconut water on the face and skin for centuries to cleanse and refresh. Often people say Asian women appear younger than one expects them to be; a great side benefit of coconut use! Clearly, the use of coconut water has many benefits for more beautiful and healthier skin and most of Paul Penders products contain coconut water or coconut oil as well. Give Away All You Know, and More Comes Back To You. The problem with hoarding is you end up living off your reserves. Eventually you’ll become stale. If you give away everything you have, you are left with nothing. This forces you to look, to be aware, to replenish. Somehow the more you give away the more comes back to you. Ideas are open knowledge. Don’t claim ownership. They’re not your ideas anyway, they’re someone else’s. They are out there floating by on the ether. You just have to put yourself in a frame a mind to pick them up. The book (ISBN 9780714843377) is for everyone who aspires to succeed in life! Not long ago we searched for natural hair colorants able to dye hair naturally. Henna, as an example, can be a great natural color ingredient but by itself does not cover gray hair. Henna and other hair color products that do cover gray hair contain the chemicals p-phenylenediamine (PPD) and p-toloenediamine (PTD). Cosmetic companies that claim to produce all-natural hair dyes are aware of these chemicals in their products. Many of these companies do not put these chemical names on their product labels. In our own market research no natural alternative to chemical dyes have been found. 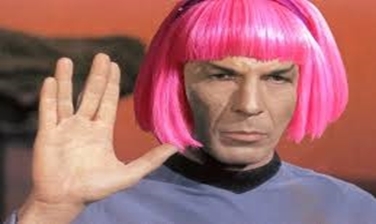 All hair dyes marketed as natural that claim to cover gray hair in fact mislead consumers. They hide the facts and sorry … no exception to the rule. Recently researchers from Leeds University developed a natural hair color formula that removes p-phenylenediamine (PPD) and p-toloenediamine (PTD) to replace them with botanical ingredients. Progress is made and it looks that maybe a permanent hair dye made from botanicals could be made, yet such product still needs many years to be tested to get it ready for the consumer market. Therefore, consumers still need to make difficult choices. In case they want to use all-natural hair colorants they need to think twice. It is true that the FDA doesn’t do enough to protect consumers from companies that market hair dyes as a natural product.